Whip dinner out of cheap country-style boneless pork ribs and some barbecue sauce. Get your slow cooker or Crock-Pot out of the cupboard and put it to good use. Dinner was never so easy, or so delicious! Serve with mashed potatoes and cole slaw or broccoli or a salad. Spray inside of slow cooker crock with nonstick spray. Place sliced onion in bottom, and sprinkle garlic on top. Rinse and pat ribs dry, and place them on onion. Pour barbecue sauce over top, sprinkle with oregano, cumin and chipotle, put lid on and cook on LOW for 8-10 hours. Remove ribs from sauce and set aside. Place sauce in small saucepan and boil for 3-8 -ish minutes, until sauce thickens (from evaporation). Serve ribs in wide bowl and pass sauce in a gravy boat for diners to serve themselves. The rule of thumb for slow cookers is 1 hour on HIGH = 2 hours on low, so if you wanted to make these twice as fast, you would cook them for 4-5 hours on HIGH. Since all slow cookers cook at different temperatures and different efficiencies, it pays to “stick a fork in it” an hour or two ahead of time and see if it is done! 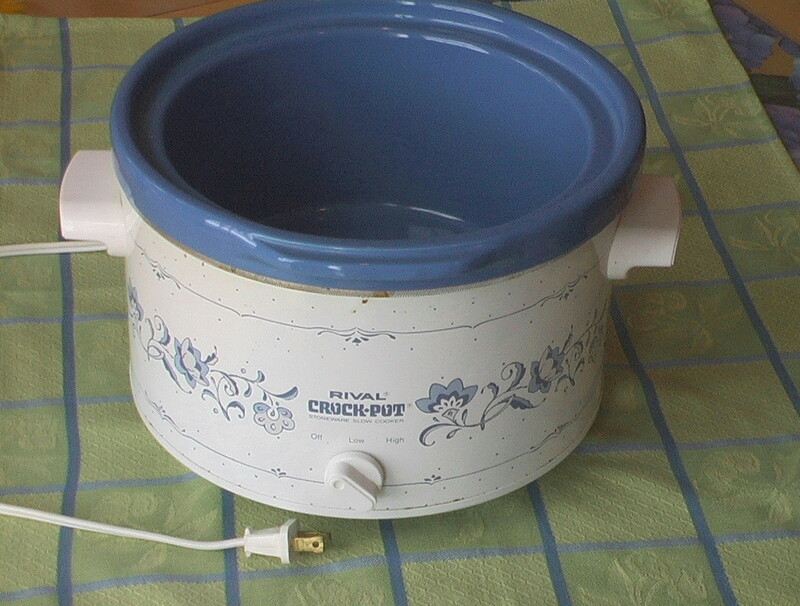 My favorite Crock-Pot is this, circa 1970s. Thanks, Mom!